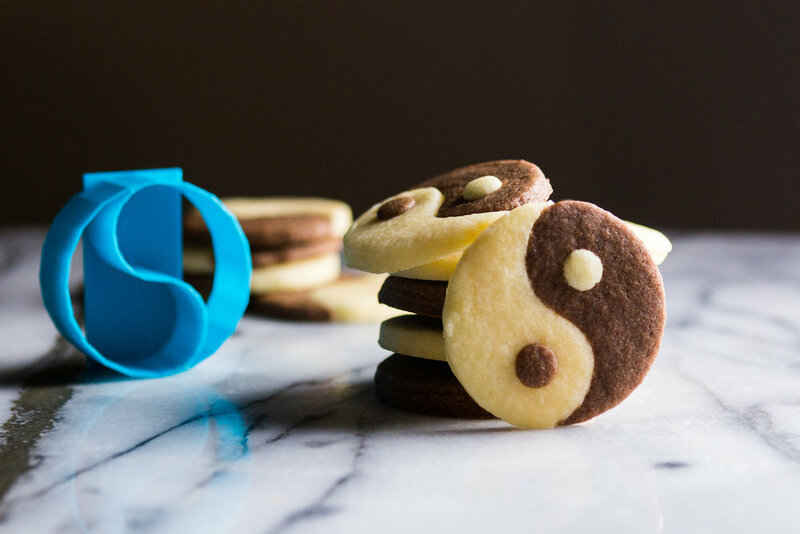 Yin Yang Cookies — knead. bake. cook. In terms of taste, these cookies are the best of both worlds when it comes to chocolate and vanilla. I’ve always been a big fan of chocolate and vanilla soft-serve and these cookies are a similar compliment. The recipe is similar to that of checkerboard cookies, but results in a unique shape that makes it way more fun. Someday, I do want to try making checkerboard cookies, even though forming the dough in a rectangle seems tedious. If I can do it in a cake, and I am willing to make these cookies, how hard can it really be? And then I found this cat cookie cutter which sounds like a lot of fun as well! Whisk flour, baking powder, and salt to combine. Set aside. In a stand mixer bowl fitted with the paddle attachment, beat the butter until creamy. Stream in the sugar and beat until light and fluffy. Add the egg and vanilla and mix until combined. Slowly add the flour mixture to the stand mixer bowl until the dough comes together. Remove half of the vanilla dough (this is your yin dough), wrap in plastic and put into the fridge. Add the melted chocolate, and cocoa powder to the remaining dough, and mix to combine (this is your yang dough). Chill both doughs for at least an hour before rolling out the dough. When ready to bake, preheat oven to 350ºF. Lightly dust a work surface with flour and roll out the vanilla/yin dough to a ¼-inch thickness. Flour the cookie cutter before using and start cutting out yin swirls. Place one half of the yin swirls on a baking sheet. Roll out the chocolate/yang dough to a ¼-inch thickness and cut out yang swirls. Connect the yang swirls to the yin swirls. It is okay if they are touching! You may need to rotate them in the right orientation to form the full symbol. Break off small balls of dough about ¼-inch in diameter and press lightly into the opposite dough to create the dots. Bake for 8-10 minutes and let cool for 5 minutes before placing on a wire rack to cool completely. Repeat process with the remaining two doughs.